The American Human Rights Council (AHRC-USA) joins the nation observing Veterans Day that falls on this Saturday, November 11, 2017. 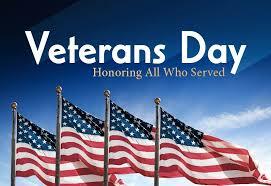 AHRC-USA salutes American veterans on this occasion and recognizes their great sacrifices on behalf of our nation. Veterans Day, formerly known as Armistice Day, observed every year on November 11, is a day to remember the shared and common American values of liberty, justice and freedom for all. AHRC-USA takes this opportunity to remind all of the sacrifices that veterans made for all of us and of the obligation of our country to thank them for their service by taking care of them. AHRC-USA recognizes that too many of our veterans have unmet needs in transitioning from active service to civilian life. Many of our veterans continue to face great challenges that mandate our nation’s attention. “American veterans continue to face challenges transitioning to civilian life,”  said Imad Hamad, AHRC Executive Director. “Veterans day is a reminder of the sacrifices that America’s men and women in uniform make every day and the debt that the country owes them,”  added Hamad.